Sally Run: Spring has sprung! We have been enjoying the warmest, earliest spring we have ever had since we moved to Wytheville 11 years ago! The horses cannot shed out fast enough, and the grass is threatening to take over, but we are enjoying every minute of it! The pony B&B has run into a temporary standstill as we work out stain issues, but if you have ever built a house or barn with wood siding and then built another one more than 4 years later and tried to match the stain, you know what we're dealing with. Products change, colors fade, and matching existing structures becomes an exercise in frustration! However, the stalls, windows and doors all arrive on Tuesday, so we will hopefully start to see some progress again soon! 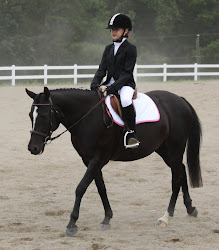 On the horse front, I would love to list our horseshow plans and goals for the year, but for now we are in a wait-and-see mode. Glory continues to be her fantastic self, Caruso is gradually getting back in shape, and Barney - well, Barney is still a little bit of an unknown, but he looks awesome on the lunge and is thoroughly enjoying his life in the field. I am amazed at how much happier my horses seem when the weather cooperates, and they get to spend their lives outside. As much as I love to watch the super fancy dressage horses, I don't think I could ever have a horse who was either too valuable or too hot to turn out, and since I am not aiming for the Olympics here, I don't think it will ever be a problem! On the cow front, we are down to just a handful of heifers left to calve - woohoo!! The weather has made for an awesome calving season, and the kids have thoroughly enjoyed bottle feeding the two calves who were each the small ones out of two sets of twins. Shockingly, I think our alfalfa is almost ready to cut - which is a little bit insane, but hopefully this great grass and growing season will continue! So, that's what's happening around the farm. We are getting ready for our baby girl's birthday this week and the arrival of family and friends to celebrate number 12 along with Easter! Hope everyone has a blessed holiday weekend, and we'll start gearing up for the clinic series in just a few weeks!! One Month and Counting . . .